Jaco, Puntarenas – Costa Rica beachfront beauty and all the glory of having an unobstructed ocean view to the Pacific Ocean, as well as jungle covered hills and the town below. 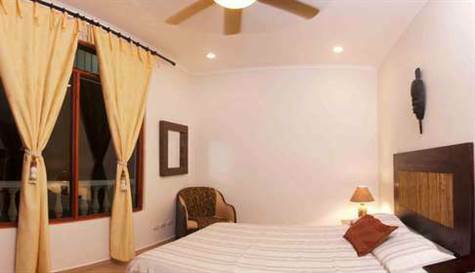 This condo for sale in Jaco Beach is a premium location, unit is sold with high end furnishings and appliances, common areas and facilities are the finest in local luxury. 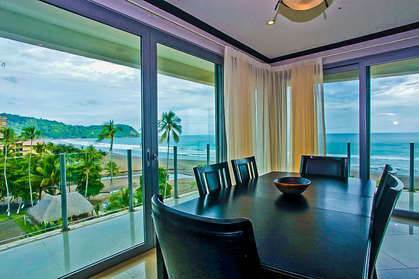 This is a large unit of 2265 square feet, with huge balconies built to glorify the splendor of Costa Rica beach living. Location is ideal for owners and guests, as it is pure beachfront, yet an easy stroll to the heart of Jaco. There is designated parking on site, 24 hour security and maintenance as well as property management (as needed). Live the dream and invest at our current Buyer’s Market price. Jaco, Puntarenas – Imagine sitting out on your living room or master bedroom balcony viewing another glorious sunset at South Jaco Beach, Costa Rica saying to your-self, “I have finally arrived!” Not only is this condo situated for unobstructed ocean views, it is beautifully furnished and appointed and at the best part of the beachfront in Playa Jaco. Jungle covered hills enclose the south end of the beach here and a natural cove provides safe swimming and gentle waves. The sand is soft, no rocks, and swimsuits are bare-feet are a way of life! Condo ownership has never been more affordable than right now. This asking price by motivated owner is completely in tune with our current Buyer’s Market for Jaco Beachfront condos for sale, and as a bonus, the rental market for beachfront condos in Jaco has never been stronger. Buy now at unheard of low prices, rent the condo out as needed to cover operating costs and enjoy the “Pura Vida” of beachfront condo ownership in gorgeous Jaco Beach, Costa Rica. Appreciation is encouraged by a new boardwalk being installed NOW (I am writing this Feb.24th, 2016) in front of this part of the beach, and Jaco is once again booming with new shopping areas, restaurants, bars, and a massive 55 million dollar casino project that has since been completed. 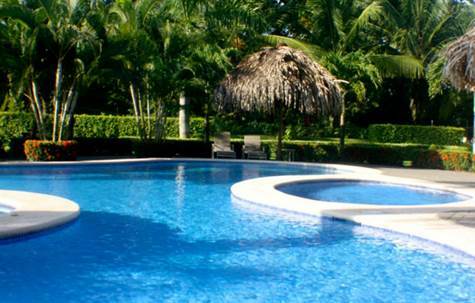 Playa Bejuco, Puntarenas – Welcome to Casa Xanadu II in Playa Bejuco, Central Pacific, Costa Rica! This beautifully finished brand new beach home w. private swimming pool is located in a gated community within easy walking distance to one of the prettiest beaches in the country. Finished in May of 2016, designed by North American owners (also residents of the community) who have built and sold several highly desirable homes at affordable buyer’s market prices. While most of the original homes in this community are 1600-1800 square feet with less living space, this home has a customized floor plan of 2500 square feet, with three spacious bedrooms with en suite bathrooms, closet space, crown molding, ceiling soffits, recessed lighting, beautiful stone bathroom fixtures and tile, garage, two car driveway, amplified tiled outdoor patio space and brick walkways. The extra square footage is well incorporated into a large living room and LARGE kitchen, yet maintains the integrity of large bedrooms as well. The kitchen is a dream, featuring spacious countertops of the highest quality granite, breakfast bar, fantastic cabinets and shelving, deep sink, wine rack, etc. All appliances are high end brand names and brand new. This is the fully functional and modern kitchen you’ve always deserved! The home is sold turn-key, equipped with high end furniture, granite and custom bathroom stone work, designed vanity sinks. There is no substitute for the quality and functionality of this home. The community itself, established in 2005, is one of the most successful gated communities in the Central Pacific, with low HOA fees (only $200 a month, includes gardening), underground electric, paver brick roads, waste treatment plant, common areas with tennis court, two beautiful swimming pools and shower/bathroom areas and management office on site. Most owners walk, bike ride or golf cart to the beach. Bejuco Beach is located 2 hour drive from international airport in San Jose, 20 minutes south of the beach city of Playa Jaco, as well as being 30 minutes to the world famous Manuel Antonio National Park, there are shops, restaurants and hotels in the area as well as an abundance of outdoor activities including surfing, swimming, waterfalls, wildlife, flora and fauna, fishing, the list goes on. 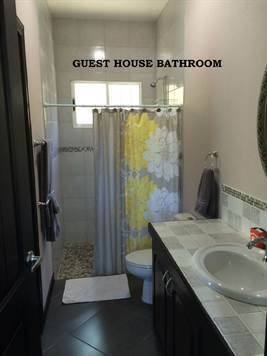 Please call or write to discuss viewing this exciting new listing. 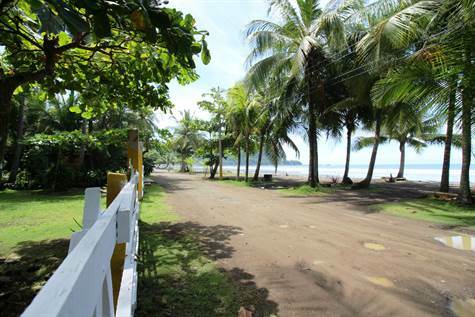 Playa Jaco, Jacó – This exciting new listing is a beautiful, beachfront 100% titled lot in Jaco, Costa Rica, premium real estate of boundless potential. This flat lot is of a substantial size (1828 square meters/ 19,700 sq. feet) with views, location, and surroundings at the best part of Jaco Beach. LOT HAS 21 meters of frontage facing the ocean. There can never be anything built in front of this property. The smooth compact sand, right at the southern tip of the bay, surrounded by jungle covered mountains adds to the enchantment of this a dream location. Only 10% of Costa Rica’s coastline is titled, so act quickly! Walk out your front gate to the gorgeous Pacific in all its glory, easy access to all points in town and one of the last pieces of beachfront in Jaco that is available. There is already all services and utilities to the lot with two structures already in place. These dated and “tico style” structures are probably “tear down” as more value could be utilitized with building new structures like a beachfront dream home, condominium complex, hotel etc. However, these structures are fully functional as needed. The town of Jaco is experiencing solid growth as the Capital city of San Jose stretches westward and the continuing popularity of Costa Rica never stops. Call me or write immediately as this WILL NOT LAST!